The Texas Hunger Initiative Hunger-Free Communities RCNPC Project is designed to strengthen collaboration among local and regional stakeholders for the purpose of improving coordination and access to nutrition assistance programs. This project targets communities and school districts in the Texas border counties of Cameron, Hidalgo, and Starr, and forms county-level Hunger-Free Coalitions. The coalitions will focus their efforts on increasing participation in federal Child Nutrition Programs such as School Breakfast, Afterschool Meals, and Summer Meal Programs, as well as promoting access to the Supplemental Nutrition Assistance Program (SNAP), the Women, Infants, and Children Program (WIC), and the Food Bank and Food Pantry program. Adults having difficulty using Your Texas Benefits, the state’s online application process for SNAP, CHIP, TANF, and Medicaid. In general, South Texas residents seeking assistance through Your Texas Benefits have limited internet access and low computer literacy. Family members have different legal statuses – such mixed legal status causes them to question their eligibility for assistance, and as a result they are hesitant to seek assistance. Many summer meal programs only run for part of the summer (during summer school), leaving children without access to food the rest of the summer holiday until school starts again. School meal sponsors have difficulty complying with USDA nutrition standards and reimbursement regulations. Some school nutrition departments have limited personnel resources and do not feel they have the capacity to expand afterschool and summer meal program sites. Community stakeholders have a weak understanding of the link between poverty and food insecurity. 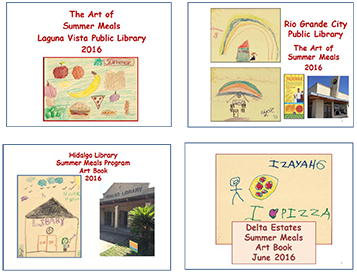 Promoting National School Breakfast Week, National School Lunch Week, and SummerMeals through social media and distribution of flyers and signage; use children’s art as ameans of publishing student testimonies of their participation in school breakfast andsummer meal programs. Support the annual Food Insecurity Forum at the University of Texas – Rio Grande Valley (each April) in promoting policy development that expands opportunities for localorganic farmers, Farmers’ Markets and accessing SNAP and WIC at these locations.This annual forum highlights the links between poverty and food insecurity and seekspossible local solutions through policy discussions. Targeted Nutrition Assistance Programs: SBP, NSLP, CACFP, SFSP, SNAP, WIC, and the Food Bank and Food Pantry program.